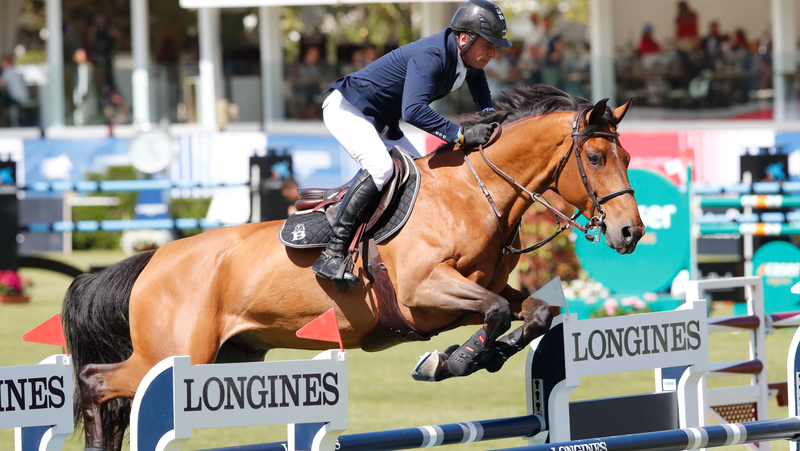 The Flying Frenchman, Julien Epaillard (FRA), kick started the Longines Global Champions Tour of Madrid with a win aboard Instit de Jucaso, finishing almost two seconds ahead of the rest of the field. Maikel van der Vleuten (NED) took second with Dana Blue, and third went to America’s Laura Kraut with the chestnut mare Whitney. 72 riders took to the first class of the weekend, with the 1.45m competition the perfect scene setter for a spell-binding weekend of top show jumping action. The flowing course stretched the width and breadth of the foot-perfect grass arena, with riders given plenty to think about including a water jump option and a formidable looking Massimo Dutti oxer, quickly followed by a AirEuropa double set against the grandstand. The first class of the weekend was a chance for riders and horses to flex their muscles ahead of the GCL and Longines Global Champions Tour Grand Prix of Madrid, and fans were treated to a brilliant display of horsemanship and horsepower. Simon Delestre (FRA) debuted Hermes Ryan for his first outdoor CSI5* of the season, with the feisty chestnut gelding looking on flying form, producing a clear and looking to be a threat for the win this weekend. Former LGCT Grand Prix of Madrid winner Maikel van der Vleuten (NED) looked determined with his grey mare Dana Blue, powering around the second phase to stop the clock in 28.39s and shoot straight to the top of the leaderboard. Hot on his heels was Laura Kraut (USA) and Whitney, who, despite loosing a boot halfway round, put in a blistering display of speed to stop the clock just moments behind in 28.68s. Others followed, with Daniel Deusser (GER) and Cornet D’Amour, Athina Onassis (GRE) with Cinsey, Jerome Guery (BEL) with Kel'star du Vingt Ponts, Philipp Weishaupt (GER) with Call Me Eva, Alexandra Thornton (GBR) with Charielle, Henrik von Eckermann (SWE) with Newton Abbot, Kevin Staut (FRA) with Click n'Chic HDC, Denis Lynch (IRL) with RMF Cadeau de Muze, Dayro Arroyave (COL) with Koriano van Klapscheut, Julio Arias Cueva (ESP) with Reggae du Tillard and Paola Amilibia Puig (ESP) with Gaudi just a few of the 34 clears. As the afternoon unfolded, the pressure was on to better van der Vleuten’s time, and poles began to fall. Julien Epaillard (FRA) and Instit de Jucaso looked set to take the first win of the weekend, powering through the starting gates, the French rider utilising his horse’s stride to eat up the galloping distance. Pushing to the last, the duo stopped the clock in an impressive 26.60s, almost two seconds ahead of long time leader Maikel van der Vleuten (NED). Bassem Hassan Mohammed (QAT) and Argelith Squid put in a valiant effort to stop the clock in 28.79s, but couldn’t better the Frenchman’s time. So it would be an early win for Epaillard, the Frenchman kick starting his weekend in the sultry Spanish city in style. The GCL Madrid first round kicks off at 18:15 local time - tune in via GC TV to watch the action live or via the official Facebook page.